A key to predicting and effectively using customer lifetime value (LTV) is to take a long-term view of your data and not just rely on the first month or even first few days. Many marketers will draw conclusions about a new product launch, a new feature or a unique customer cohort based on the initial data they generate. While you cannot wait months or years to make crucial business decisions, understand that these predictions are less reliable and thus making decisions based on this data is problematic. While intuitively more data is always better, there are challenges involved in looking back over a long period. First among these challenges is customer attribution. If you are determining the value of a specific growth channel, do you credit the lifetime spend of a user to the channel you used to acquire them initially or do you attribute the revenue to a channel (Facebook feed, email, A2U notification, etc.,) that brought the user back after a long period of inactivity. Excellent post on the different personal interests you need to understand when doing deals (or corp dev), shows the importance of looking at the individuals and not just the company-to-company relationship. I have been intrigued for years that a huge financial sector has continued to rely on intuition while industry after industry has discovered that using analytics give you a better chance to succeed. Moreover, it is a sector that brags about the fact that it fails 99 percent of the time yet fails to embrace methods to improve those odds. I am talking about venture investing, the venture capital industry. For those who have seen the movie or read the book Moneyball, which I have written about multiple times, one of the most poignant scenes is the Oakland A’s smoke filled draft room where scouts with years of experience determine the best prospects to select based on their gut of what makes a great baseball player. When I first read about it, the parallels to how game company executives select what games to green light were incredibly apparent and I was certain you would see a similar transformation of the game industry. We did, with analytics driven social game companies putting many old school game companies out of business. 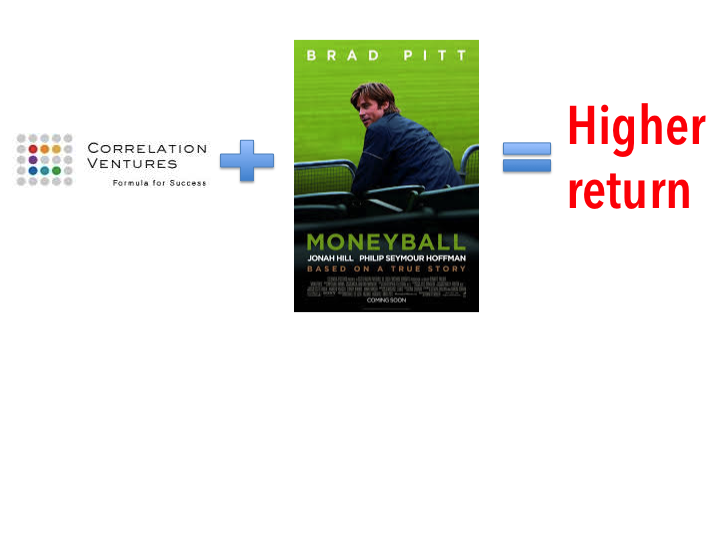 The venture capital space has uncanny parallels to the pre-Moneyball baseball industry. You have investors with years of experience sitting in Red Bull filled rooms deciding which investments to pursue based on intuition. The claim that they are investing in the management team is another way of saying they are selecting those leaders who feel like rock stars; who they think look like a star. They are basing it on measurable that they feel are important but have not proven empirically are the keys to success (just as baseball executives undervalued walks and over-valued defense). The best and most empirically supported strategy book I have ever read is Blue Ocean Strategy and the authors of the 2005 book, W. Chan Kim and Renee Mauborgne, just published a great article on the Harvard Business Review, “Blue Ocean Leadership.” The need for blue ocean leadership is highlighted by the statistics that only 30 percent of employees are actively committed to doing a good job, 50 percent just put their time in while 20 percent act out their discontent by negatively influencing co-workers, missing days on the job and driving customers away through poor service. Just step back and re-read that last sentence: 20 percent of all employees in the US act in counterproductive ways. Poor leadership is the cause of this widespread employee disengagement, according to US polling agency Gallup. People do not intend to be poor leaders but they lack a clear understanding of what changes it would take to bring out the best in everyone and achieve high impact. The authors extend their research and theory from Blue Ocean Strategy, which essentially is a framework for turning non-customers into customers, and applies concepts and analytic underpinnings to help leaders release the blue ocean of unexploited talent and energy in the organization. The key insight is that leadership should be considered a service that employees “buy” or “don’t buy.” Every leader has customers, the bosses the leader must deliver performance and the followers who need the leader’s guidance and support to achieve. When people value your leadership, they are effectively buying your leadership. They are inspired to excel. Conversely, when they do not buy your leadership, they disengage, becoming non-customers. Focus on acts and activities. Blue Ocean Leadership focuses on what acts and activities leaders need to undertake to boost their teams’ motivation and business results, not on who leaders need to be. It is much easier to change people’s acts and activities than their values, qualities or behavioral traits. Activities are something that any individual can change, given the right feedback and guidance. Connect closely to market realities. Under Blue Ocean Leadership, the people who face market realities are asked for their direct input on how their leaders hold them back and what those leaders could do to help them best serve customers and key stakeholders. When people are engaged in defining the leadership practices that will enable them to thrive, those practices are connected to the market realities against which they need to perform, and they are then highly motivated to create the best possible profile for leaders and to make new solutions work. Their willing cooperation maximizes the acceptance of new profiles for leadership while minimizing implementation costs. Traditional leadership development programs tend to be quite generic and are often detached from what companies stand for in the eyes of customers and from the market results people are expected to achieve. Distribute leadership across all management levels. Blue Ocean Leadership is designed to be applied across the three leadership levels: top, middle and frontline. It calls for profiles for leaders that are tailored to the very different tasks, degrees of power and environments that you find at each level. Extending leadership capabilities deep into the front line unleashes the latent talent and drive of a critical mass of employees, and creating strong distributed leadership significantly enhances performance across the organization. Conversely, most traditional leadership programs focus on executives and their potential for impact now and in the future. I recently read an article on Sociomantic, “Customer Lifetime Value in Three Dimensions,” about looking at lifetime value (LTV) tied to the customer journey and it adds another dimension to calculating lifetime value that could greatly improve its predictive value for you as well as pointing to areas for improvement. 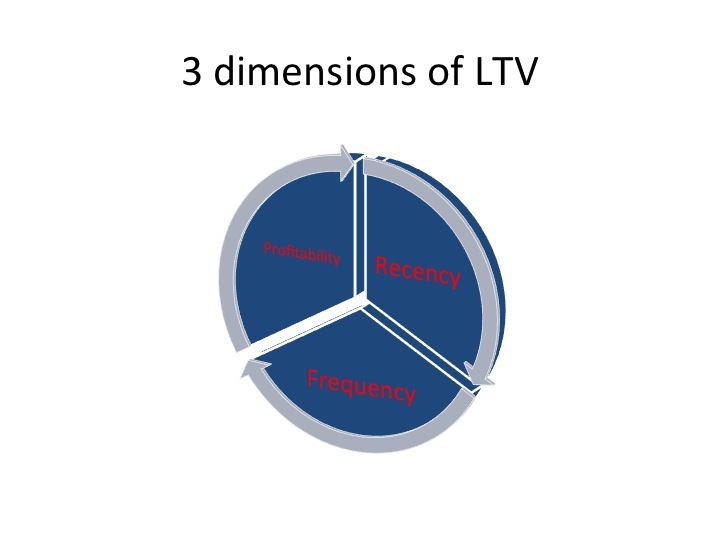 The article breaks LTV into three dimensions: recency, frequency and profitability (Note: The authors refer to the third dimension as “monetization.” Based on my previous posts on monetization, I felt this term would confuse my readers, as our definitions differ).